Then he said if I could come in on Saturday for the TPS reports, that'd be greaaaaaaaat. What a jerkerto. Sarah S. says this squirrel also has an obsession with coffe. Well, obvy. but his paws are sort of creepily prehistoric. Ugh, squirrel boss. 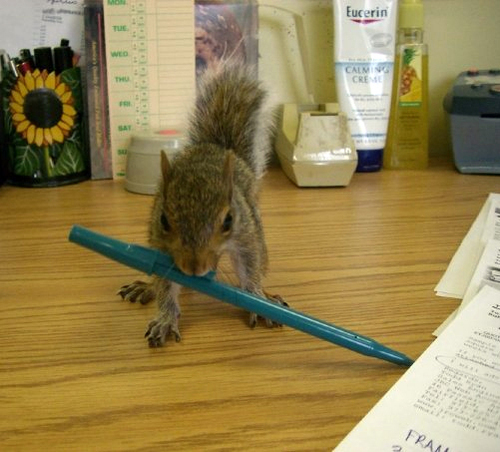 Makes all the squirrel interns fetch him acorns. Ruuuuude. "I believe you have my stapler ..."
Wow, I wonder if he's someone's pet or rehab pet? How could I stay angry with a boss who looked like that? I can't imagine how hyped-up a skwerl on coffee would be. I think it's positively risky to expose them to that kind of substance. It most likely increases their evil powers tenfold. I am just sorry - I would have to kiss my boss - and probably get fired if my boss were that adorable and had a fluffy tail-o like that. I would do TPS reports until my knuckles turned black and blue if he wanted me to - on Sundays - on CHRISTMAS! *splodes* what an adorable office squirrel! WHO TOOK THIS PICTURES AND HOW?! i lurve squirrelys. yes he is cute, i'll give you that. but the bigger question is WHY is there a squirrel inside someone's office. we once had a squirrel get into our house and it was not a pleasant experience at all. AT ALL. more like terrifying. I hate it when my boss lectures me from the stapler! That is a very tiny squirrel! Is he a baby or just a little mini one? That squirrel accomplishes more in the office than some people I've worked with in the past. Looks like an adorable little mini-squirrel. EEP! Bebbeh sqwerls!!!!! They are so freakin' adorable. I miss them. Thanks for cute!!! That's an overload of it! Gah! I want a sqwerl in my office too!! This must be the official headquarters of the Skwerl Overthrow Branch, or S.O.B, of Evil Otter International. Hm. My boss IS squirrelly, but he's not a skwerl like this one. I'd love to have a little baby skwerl as a desk ornament. is the squirrel boss taking away your swingline? Better pack up your stuff because he'll be banishing you to the basement soon enough. I'm in an office right now. I don't have a Swingline (generic Staples brand) but I do have an Initech mug! Bosses, in my experience, don't go for that so much. You know, it's that last photo that just does it. The fact that the little guy can sit on the cup and drink out of it is amazing, though I doubt his little lungs have the sucking power to get any liquid up that massive (relative to him) straw. 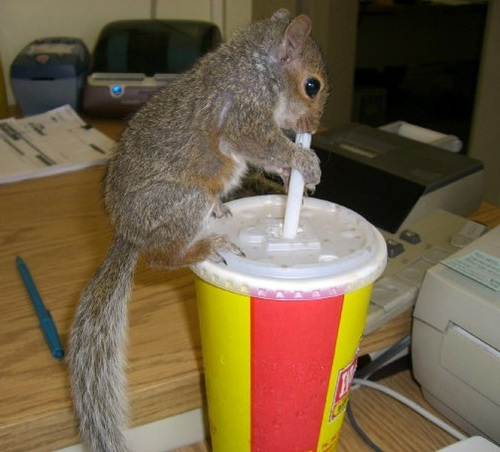 LOL at the squirrel trying to drink from the straw! But what is he doing at work? Somebody obviously needs another rubbing with that calming lotion. zomg!! will someone tell me the story behind these photos?? Dying to know!! Pretty darn cute, if you ask me. He could be my boss anytime. Yeah, we definitely need the story behind this one. I wonder if the squwerl is merely middle management, and he works for the Grumpy McGrumpersons cat from the other day? "The squirrel kicked our a$$." I could comb out MR skwirls tail, I could fit MR skwirl in my pocket..
then there are the disadvantages.. I would be working for peanuts... and I would have to help the evil skwirls take over the world..
Well I think the advantages out weigh the disadvantages.. oooohhhh!!!! CUTE, MY GIRLFRIEND AND I WERE FORCED TO NURSE A SQUIRREL AFTER A TREE WAS CUT DOWN AND TWO BABIES FELL FROM THE TREE, FINALLY WE SET THEM OUTSIDE FOR THEIR MOM TO TAKE THEM, TOOK ONE THEN THE OTHER WE THOUGHT WE WOULD KEEP, WE HAD ALREADY NAMED IT "SOBER"!!!! 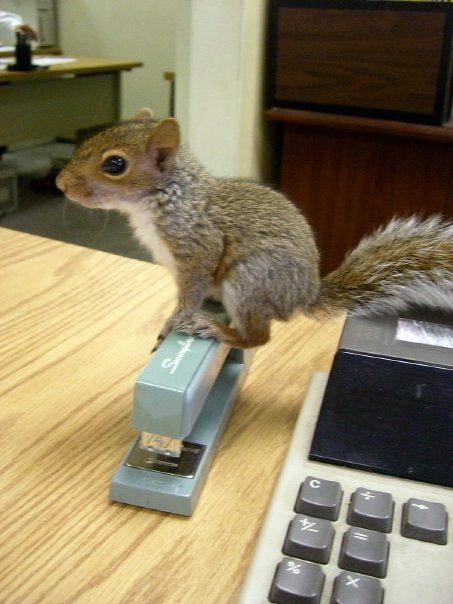 Oh, and not to make ya'll TOO jealous, but I have a squirrelless but maroon Swingline stapler on my desk. "do you mind if i have some of your tasty beverage to wash that down?" you know thoes Dublin sqwirls love their Wendys soda (and fries)! At least the ones at OSU Med Center love the fries! YAMichelle, I didn't think it was possible for possums to be that kewt! If only we could all be as pretty as when we were babies. I'm looking for a job and these people are at their jobs misspelling squirrel.He is a cute little guy.